BMW introduced the MINI marque in 2001 and doing so successively reviving a cult classic. Retro styling combined with German engineering and the newest technology produces an agile, squared cornered sports car that is fun to drive. The Cooper, the supercharged or turbocharged Cooper S, Convertible, the bigger Clubman, some with factory add on performance packages John Cooper Works, makes the MINI a fast, unique small car. European Auto Tech’s master technicians have been performing routine maintenance, diagnostics and repair of all models of MINI Cooper vehicles for years. Our knowledgeable and courteous staff has the experience, skills and equipment to affordably diagnose and repair all MINI Cooper issues, and provide the regular preventative maintenance your MINI Cooper needs to keep it running smoothly for years to come. Once we have diagnosed a problem with your MINI Cooper, our goal is to share as much information as possible with you, along with our recommended solution in a way that is easy to understand. In many cases, we will discuss different options for repairs and the risks and benefits associated with each. No work is conducted on your MINI Cooper without your express permission to do so. 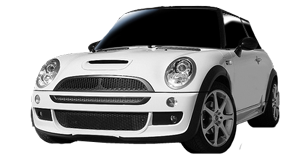 Our objective is to always provide you the highest quality repair at competitive pricing, all the while treating your MINI Cooper as if it were our own. The following are some of the most common MINI Cooper issues we have serviced in our Tucson shop. The most common culprit for squealing and grinding noises in these vehicles is the harmonic balancer failing and coming apart. The squealing and grinding is a result of the outer ring slipping on the inner ring of the balancer. If driven this way can also lead to the outer ring of the balancer grinding into the lower timing chain housing causing more damage. Often times, the timing chain tensioner is “not extending” far enough (according to MINI) to maintain tension on the timing chain. The correct repair is to replace the timing chain with guide rails and tensioner. While not a trivial repair, if left and not repaired in time the timing chain can jump timing allowing the valves to collide with the pistons causing extensive engine damage. European Auto Tech can service your MINI before such a catastrophic event occurs. The inside door release handle cable becomes dislodged from the latch housing due to its design. This can be repaired by putting a piece of friction tape on the cable and placing it back into the latch housing. One common problem with these engines is a “carbon sludge buildup” on the intake valves. Restricting airflow into the cylinders causing a rough running and misfiring of the affected cylinders. Proper fix is to remove the intake manifold and use a walnut shell blaster to remove the buildup without damaging the valves. European Auto Tech has the specialized tools to quickly perform this repair important repair. The plastic thermostat housing on the engine warps over time, causing a continues but slow coolant leak. The appropriate repair is replacement of the housing and thermostat. Be careful, there are a lot of aftermarket knockoff thermostat housings available, and we have seen many cases of other shops using cheap housings which leads to customers coming to us for a coolant leak from their “newly” replaced housings. When it comes to MINI Cooper service, we have you covered. Our knowledgeable staff and fully equipped shop will provide you with the most comfortable MINI Cooper experience you can have. We will take care of your MINI Cooper as if it was our own. Our service includes anything from routine maintenance to complete and accurate mechanical and diagnostic repairs. We offer a comprehensive buyer’s inspection of pre-owned MINI Cooper vehicles. We perform a thorough check of major systems, body and chassis, suspension, brakes and drive-train. We then compile a complete report for the buyer giving the buyer a sense of what expenses may be incurred in the near future, how well the car was maintained and the overall condition of the vehicle, allowing you to make the most informed MINI Cooper purchase decision. We can perform your required or necessary maintenance services while your MINI Cooper is still under factory warranty. We use factory approved parts and lubricants. We will stamp your maintenance book. You are not required to take your MINI Cooper back to an authorized dealer for services or maintenance services that you are required to pay for. Contact us for details. Use the form below, or contact us by phone, to schedule an appointment to service, repair or inspect your Mini Cooper vehicle at our 1st Avenue shop in Tucson, Arizona. Let our master technicians and courteous staff make you our newest in a long line of satisfied clients.